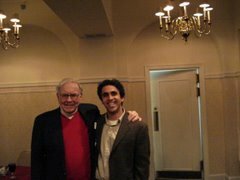 Sham Gad on Value Investing: Inspirations from Graham and Buffett: The Warren Buffett of Mutual Fund Investing? You write very well about "Mr. Hawkins and the his wonderful canvas, Longleaf." Your arguments are concise and logical. However, when I looked up the history of Longleaf Partners (LLPFX), I found that it signficantly underperformed as compared to the S&P 500 over the course of its history. The same is true of the Longleaf Small Cap fund (LLSCX). Only the Longleaf Internationl Fund (LLINX) has outperformed the S&P 500, and it has only existed since 1999. Therefore, while your underlying arguments make sense, I don't see the evidence of Mr. Hawkin's genius, at least as far as can be seen in Longleaf. He is probably not the best example of your thesis. I doubted the comment made by sara b about Longleaf funds underperforming, so I looked up the historic performance figures for myself. The fund has a 10 year annualized return of 11.38% compared to 4.63% for the S&P 500 Index. The fund has a 10 year annualized return of 13.40% compared to 6.65% for the S&P 500 Index. The fund has a 5 year annualized return of 19.32% compared to -3.26% for the EAFE Index. Data retrieved on 28 Sep 2007. The fund has a 10 year average annual return of 12.77% compared to 8.42% for the S&P 500 Index. The fund has a lifetime average annual return of 14.26% compared to 10.74% for the S&P 500 Index. The fund has a 10 year average annual return of 14.51% compared to 9.44% for the Russell 2000 Index. The fund has a lifetime average annual return of 12.77% compared to 11.08% for the Russell 2000 Index. The fund has a 5 year average annual return of 11.47% compared to 14.98% for the EAFE Index. The fund has a lifetime average annual return of 15.47% compared to 8.01% for the EAFE Index.